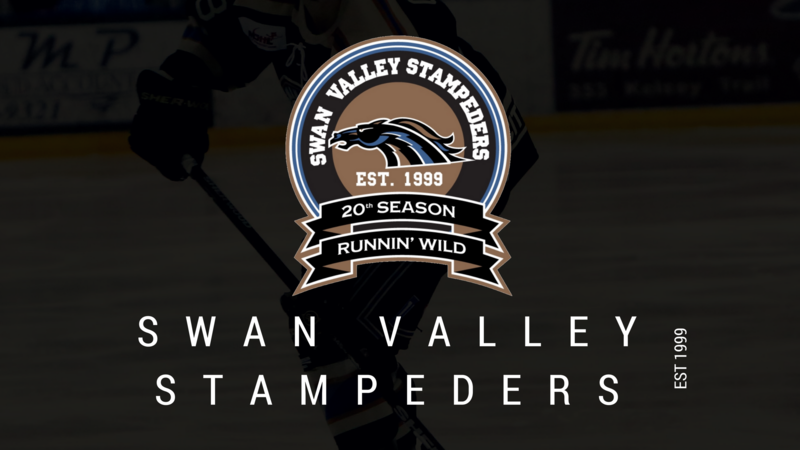 The second place Swan Valley Stampeders were back on home ice Wednesday November 7th as they face off against their highway ten rivals the Dauphin Kings. The two teams have gotten to know each other playing a total of three games against one another in the last nine days. The Stampeders had a lot of new faces in the lineup tonight that included Alex Uryga, Frank Zhong, and goaltender Merek Pipes. The Stampeders opened the first period with a lot of pressure on the Kings but could not solve Brennan Kitchen. Merek Pipes stood tall in the first period stopping all seven shots he faced. With less than a minute remaining in the opening frame, Quintin Sudom opened the scoring as he let a point shot go that beat a screened Kitchen. The Stampeders headed to the dressing room leading 1-0 after twenty minutes of play. Shots on goal were 16-7 in favour of Swan Valley. The second period saw both teams with several high quality chances but could not solve either goaltender. The third period proved to be a very tight checking period as Dauphin continued to press looking for an equalizer. Matt Osadick jumped on a loose puck and sealed the deal with an empty net goal at 19:02 of the third and the Stampeders went on to win their tenth straight home game and push their point streak to nine games. Merek Pipe’s stopped all twenty two shots he faced picking up a shutout in his Stampeder debut. Third star was awarded to Quintin Sudom who scored the game winning goal at 19:07 of the first period. Second star went to Dauphin Kings goaltender Brennan Kitchen in a brilliant effort for his hockey club stopping 33/34 shots. Tonight’s first star was Stampeder goaltender Merek Pipes as he stopped all twenty two shots he faced earning his first shutout in a Stampeder jersey. The Stampeders continue to put together a fantastic year winning every home game so far this season. The Stampeders record now sits at 13-2-1-1 which is good for second place overall in the MJHL standings. Next action for Swan will be Friday November 9th at home against the Selkirk Steeler. Puck drop is 7:30pm at the Centennial Arena. The game is proudly presented by MNP Swan River. Tickets are available at Atkinson’s Sports Excellence or at the door.